Tom McCarthy’s “The Visitor” is a fine sophomore effort after his 2003 indie-hit “The Station Agent”. This new film tells the story of a depressed college professor who strikes up a friendship with an illegal Syrian immigrant and reinvigorates his life with his youthful joie de vivre. Like “The Station Agent” McCarthy’s primary concern is character over plot, and he gives the veteran character actor Richard Jenkins the role of a lifetime. 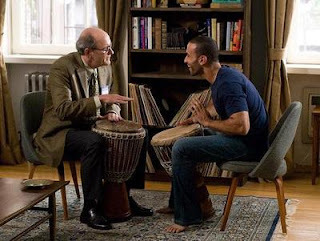 Walter Vale (Richard Jenkins) is a college professor and widower. Since his wife’s death, he’s lived a solitary existence – undiagnosed depression really. He barely works, teaching only one course a year which is run on autopilot and his latest book he attached his name to as a co-auther when he had no input whatsoever. As Vale explains, “he pretends to be busy.” Vale desperately needs a purpose or goal in life. He finds this in the form of an immigrant couple Tarek and Zainab (Haaz Sleiman and Danai Jekesai Gurira) who have been living in Walter’s vacated NY apartment. Walter befriends them and allows them to stay. Walter bonds with Tarek through his fascination with Tarek’s bongo playing. Walter takes up the instrument and everything seems blissful, until Tarek is discovered as illegal and put in detention. When Tarek’s mother Mouna arrives he has a new companion to help. McCarthy sets the same tone as “The Station Agent” – sweet, character-driven action and conflict, with a concerted effort to eschew melodrama. The decisions made by the characters are not artificial or cinematic but wholly satisfying because there’s truth, personality and dimension to the characters. Casting is key to this film as much as the screenplay. In fact, there’s very little dialogue and many scenes are played for a few seconds before cutting away. Richard Jenkins’ lanky frame and sad face has the same impact that Peter Dinklage had in the “Station Agent” and Haaz Sleiman's dimples and exotic good-looks are also impossible not to love. Just when we thought we knew where the film was headed McCarthy cleverly turns the tables in the second half when Tarek’s mother Mouna enters the film. Mouna takes over Tarek’s character and a quiet adult courtship begins. McCarthy plays the relationship very carefully. It’s one of those unconsummated romances like “Once”, the sexual tension is so palpable you want them to rip each other’s clothes off. But McCarthy never loses sight of his real-world environment and resists that melodramatic temptation. “The Visitor” is a film about loneliness and attachment. Conflict is kept largely unspoken and internal. Walter just can’t move from the loss of his wife and his attachment to Tarek is his way to break out of the shell. The climax is a cathartic moment of anger by Walter directed at the INS officers who hold Walter. While the scene serves the drama, it breaks McCarthy's own self-imposed rule of truth over artificiality. Would Walter pull a fit and yell and scream in a public place? No. But he would take it out on his bongos with the kind of force he demonstrates in the final scene. I would have done without the rage scene and replaced it with the bongo scene. It is possible to love one’s characters too much. McCarthy walks a fine line of truth and self-consciousness. “The Station Agent” is a similar but lesser film. It couldn’t walk that line and suffered from its characters’ lack of activity. While there’s much in common narratively and tonally “The Visitor” makes it across the tightrope and achieves what it purports to accomplish. Enjoy.